business) and many other kinds of bulk handling equipment. ORTS offers a wide range of grabs and lifting beams, many of which are in use on-board bulk vessels to load/unload cargoes. They are particularly useful at ports that do not have the infrastructure to offer their own loading/unloading equipment. This means that the self-loading/unloading vessel can call at a wider variety of bulk ports, without restriction. Among the equipment offered by ORTS are electro-hydraulic grabs; diesel hydraulic grabs; rope- grabs; lifting beams and special constructions. ORTS GmbH has delivered two of its radio-controlled diesel-hydraulic grabs to a customer in Oceania. These grabs are fitted with special clamshells for very fine dry bulk cargo. The design of these clamshells makes it possible to handle very fine dry bulk cargo without spillage. The speed and performance of ORTS diesel-hydraulic grabs give a competitive advantage to their users. A European shipping company ordered several sets of ORTS 12m3 volume electro-hydraulic grabs. This shipping company has a new-building project in China and all bulkers will be fitted with ORTS grabs and crane equipment, which is necessary to operate electro-hydraulic grabs. A Greek shipping company is going to fit its new-build bulkers with 14m3 volume electro-hydraulic grabs. The order includes eight EHS-B 14m3 grabs and the associated crane equipment. 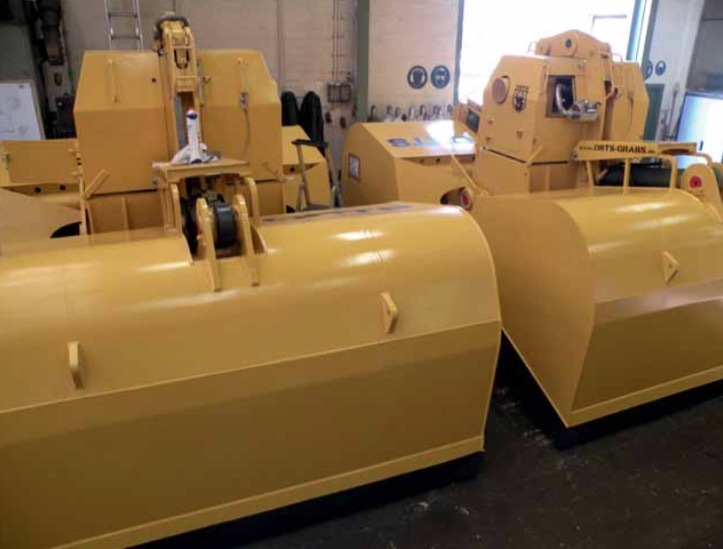 A British company has ordered a radio controlled diesel-hydraulic grab for its crane operations. The company chose the ORTS diesel-hydraulic to be flexible with its cranes and because of the grabs’ performance. ORTS has also manufactured an EHM 6m3 electro-hydraulic orange-peel grab for a German steelwork plant. Because of the special requirement due to existing cranes and grabs, modifications are necessary to enable the company to inter-change the between the old grabs and the new one. The modifications were made to enable the customer to also use the existing spare parts in stock not only for the old grabs, which are still in use, but also for the new grab from ORTS.